Lilac and pink coloured stones are perfect for the more spiritual bride as these stones represent spiritual love and high thoughts. These stones are also an excellent choice for daintier rings as they bring about a certain feminine softness to a piece of jewellery. These stones are said to promote female balance and offer protection. They are said to strengthen the body and the spirit and are also believed to aid in inspiration. Rose quartz is known as a stone of gentle love and is said to bring peace and calm to relationships. 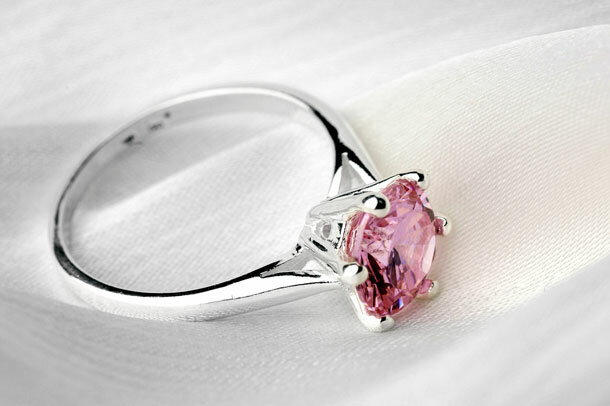 Pink diamonds are incredibly rare but they are said to represent creativity, love and romance. Morganite is known as the stone of Divine Love. It is said to attract and maintain love, helps to prevent unhealthy emotional patterns and develop trust. It also brings about a sense of joy and inner strength. Topaz is known as a Stone of Strength. It is said to calm fears and increase confidence. Kunzite is a gem that comes in shades of pink as well as different shades of lilac. Kunzite is says to calm the nerves as well as shield the heart from heartbreak. Tanzanite is a relatively new stone but it still holds a great tradition with the Masai Tribe. The Masai give tanzanite to their newly born children as they believe it will bring them good fortune. The amethyst is the birthstone of February and of the Zodiac sign Pisces. It is said that wearing an amethyst protects the wearer from the extremes of passion and from intoxicating temptations. These stones are also believed to bring peace of mind. Rhodolite is said to encourage love, kindness and compassion as well as inspire creativity and emotional healing.